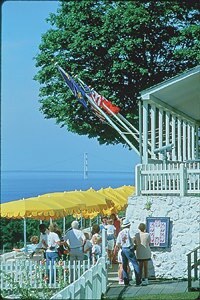 One of the most delightful and scenic settings on Mackinac Island to enjoy luncheon or a late afternoon snack. Tour this historic site and relax afterwards with a delicious meal and exceptional view of downtown Mackinac Island and the harbor. Admission to Fort Mackinac is required. A visit to Fort Mackinac includes a self-guided tour of the Fort, seeing 1780’s soldiers demonstrate rifle firings and a cannon salute over the harbor. For more information about Fort Mackinac visit click here. The Fort Mackinac Tea Room will open for the 2013 season on Tuesday, May 7th. Luncheon: 11:00 a.m. – 3:00 p.m. There is tipping at Fort Mackinac Tea Room.